Axiom Verge sits near the top of my list of Switch games for two reasons: It subverts what powers you’d expect to get next, and it turns a video game essential into a framing device. First, it turns its unique save system into a major plot point. No spoiling, but imagine the potential of an egg shaped save station. Any time you die, the egg regenerates you: the “you” who just died. You remember everything up to your death — and get to keep all your new progress since the last time you saved. In other games, death is a rewind or a “No, no, no. That’s not how it happened.” Then the story picks up as if your last actions never happened. 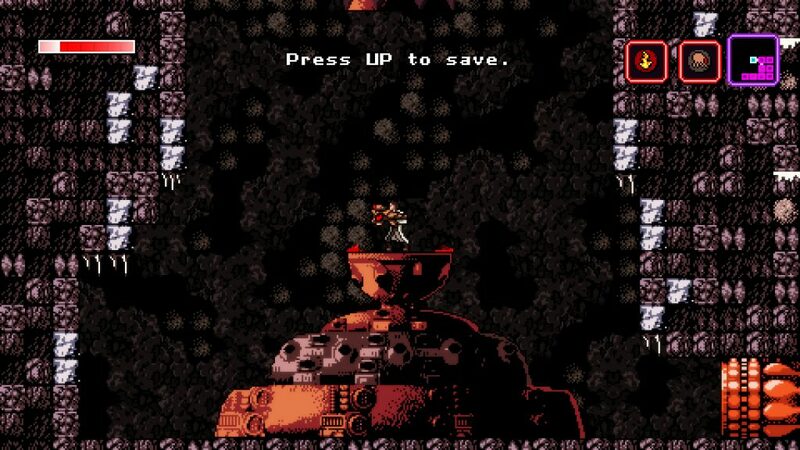 In Axiom Verge, it did happen: you died and were reanimated in a Rebirth Chamber. That death is a part of your story. Shadow of Mordor uses this similar kind of death-remembering mechanic to frame its famous Nemesis system: while you are reanimating from death, the orc who killed you got a major promotion, maybe changed the whole orc hierarchy / ecosystem. 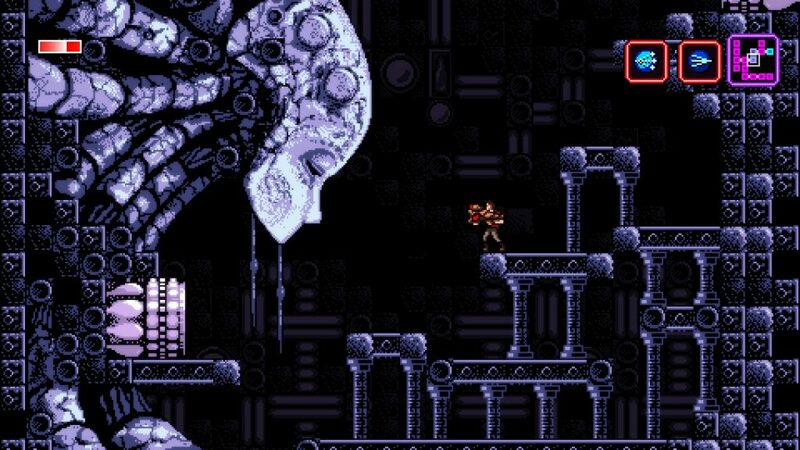 Axiom Verge’s deaths don’t change everything, though: they go for something far more subtle. 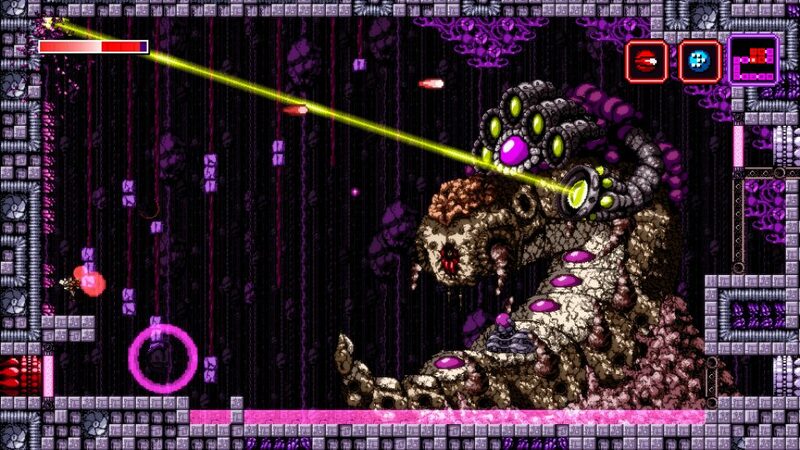 Subtle implication seems the chief aim in Axiom Verge: the 8-bit-inspired graphical language suggests definition of every unsettling alien creature in the game’s hostile world. And of course this fares more loudly when you get your reliable secondary weapon: a wave of pure-glitch that reduces enemies to their bugged-out state. That’s all well and good, but the most disquieting element of the game is your monolithic alien-village-sized allies, the Rusalki. In fact, much as Axiom’s greatest mechanical influence is Super Metroid, it goes over Metroid’s head, direct to its inspiration: HR-Giger’s work in Alien. Thus, every encounter with life forms aches at a subtle sense of horror. Tools and weapons serve-up this same trend of subtle subversion: Want to turn into a ball so you can fit into those itty bitty tunnels? How about a “cute” mite drone. See that ledge just out of reach? Need a double jump, right? Nope. Here’s a weird grapple claw shooting out of your body (I think). Need a new gun to bust through that wall in your way? Nah. You get a brown trench coat with a short two-tile teleport. You’re welcome. 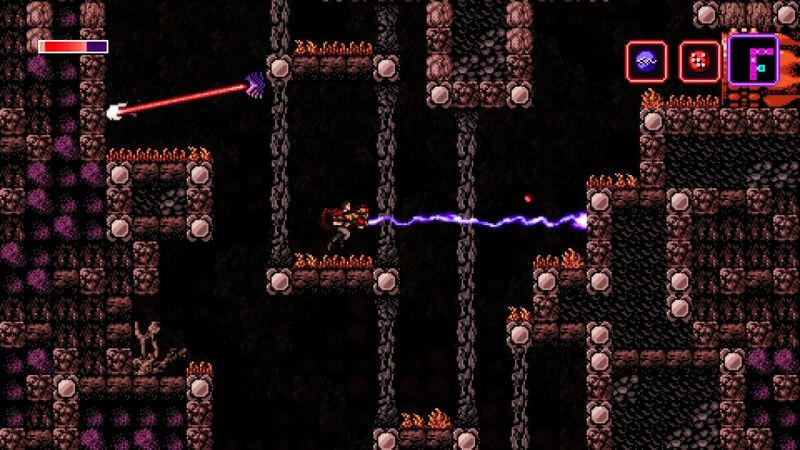 Axiom Verge subverts whatever new mechanic you’re expecting. That’s the chief reason why I kept playing. I just want to draw attention to a few moments. The first is the establishing shot: three simultaneous close ups of a bunch of science devices—with sound effects. This defines the “Axiom” name subtly by saying “it’s science stuff…” Narrative puzzle solved. Next, they establish the Egg save pods and perspective of the game—very smart, subtle way to establish the game’s genre. But that’s not enough, so there’s some basic jumping right after that. Genre established. Now you can do whatever. And that’s what Marlon does: focus on the game’s cut-scene art and press quotes. The smartest thing about this first Jeff Gerstman quote is how it establishes that narrative surprise with better words than they could ever use. Gerstman says, “You think you know how Axiom Verge will play out. You don’t.” This is gold, because it adds credibility to the game that it couldn’t say or establish on it’s own. It’s undoubtedly why Happ and Weibe elected to go the press quote route. If you can’t say things well yourself, use other’s voices. The last several shots (from 0:40-0:50) are ten shots in ten seconds. They’re far too quick for you to wrap your mind around them, but they’re there for one core reason: variety. They subconsciously say, “This game has a lot of action and variety.” And it’s relatively easy to throw a ton of shots into a trailer quick and call it a day, but Marlon’s composition here shows a deep understanding of shot-pairing harmony. It takes time to get this right, but it’s essential if you want to communicate depth and longevity to the game experience (the viewing player’s question of the value proposition). The value proposition is an excellent place to end the trailer before the logo reveal, because it’s a close direct link to the viewer’s wallet. There’s other valuable ways of addressing this (I’m a fan of the “make them feel a powerful emotion they want to feel” approach), but this “Variety and Value” approach is Old Reliable for a Reason. Axiom Verge is on just about everything, so if you have a way to play video games consider this a recommendation!